The decision was that we were not a problem and the road was theirs to use. 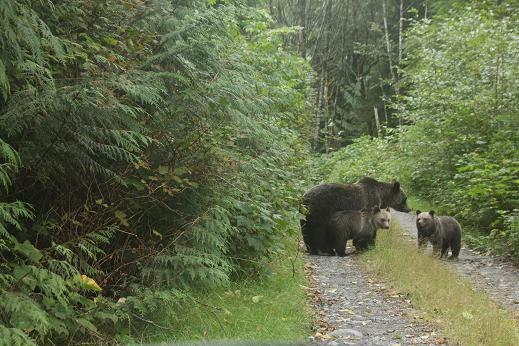 We waited and moved very slowly down the road and followed them for more than ten minutes until they found a break in the thick brush along the road. As they slowly moved off the road we were free to continue to the river and Rick’s cabin and to look for grizzlies feeding at the falls while salmon leaping the falls and moving up river. 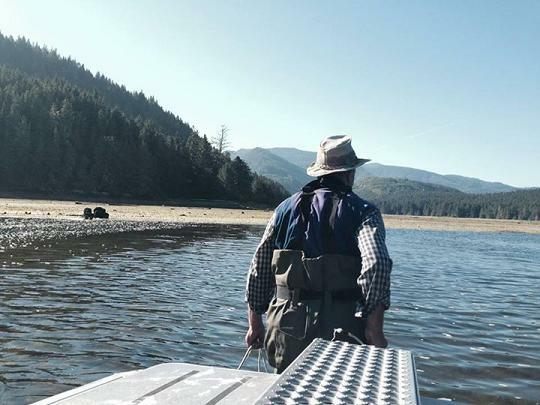 The extra day at the lodge normally means a trip to the Kakweikan River and a day with Trapper Rick. 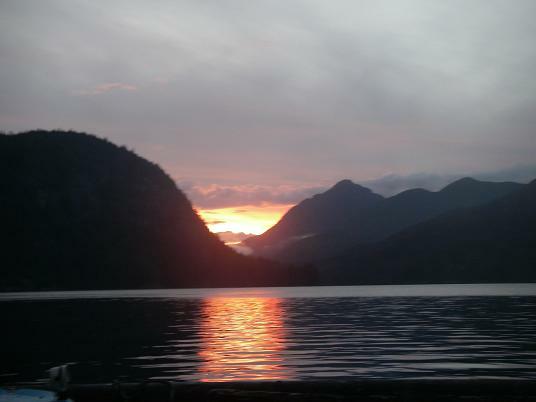 This river is located on the BC mainland and we travel by road to Rick’s cabin. 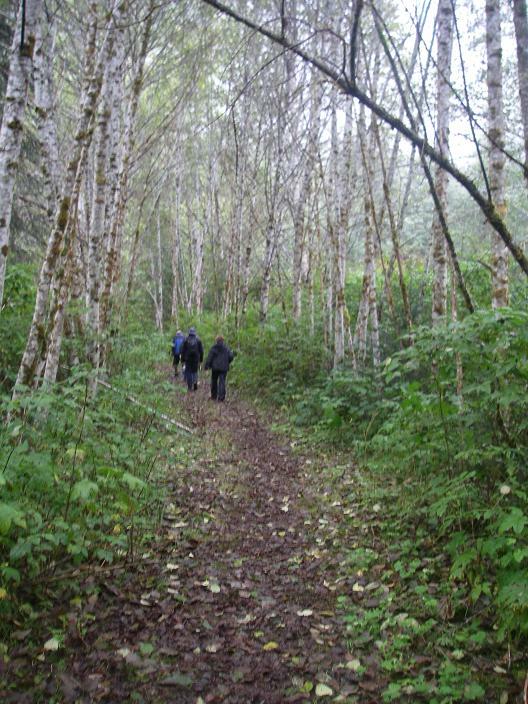 The day includes a short hike to Rick’s cabin once we have crossed the river. The walk, which follows the river, is the only time you are not aware to the mountains that surround the “wild” valley that Rick inhabits. You may wonder how you are able to get the close-up photos in the estuary tours on the Glendale River. You are in a 5.5 meter (yard) flat bottom boat that allows us to move up the river as the water rises. The quite aspect of the tour is because your guide is pulling you as we work our way up the river. 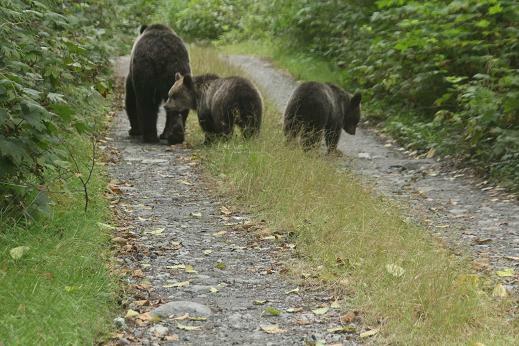 This silent approach does not scare the grizzlies especially those with first year cubs. As in all wildlife photography timing and being is the right position is important. 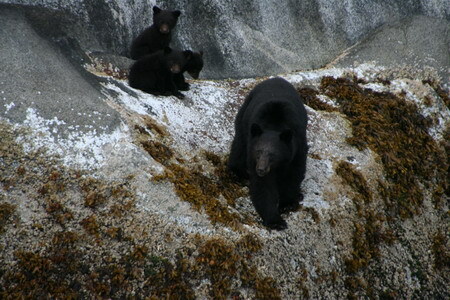 For this photo the lunge was more toward our boat and and a little slower so it was possible to get a better photo. This lunge photo was a second late. 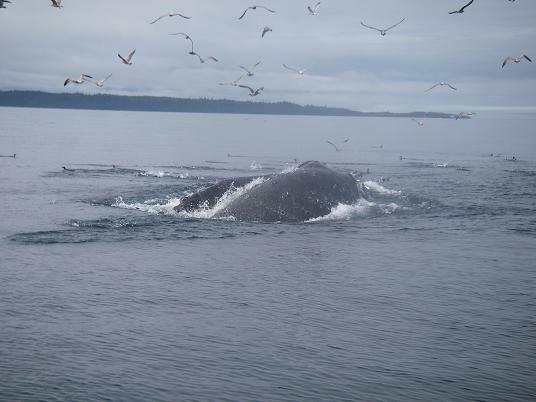 A humpback lunged toward the boat through the herring ball but has already closed its mouth. It should be more like tomorrow…. As a guide and blogger for the camp I try to get interesting shots that give me something to talk about. In this case it is a guest ready for a photo. What is so interesting about seagulls? 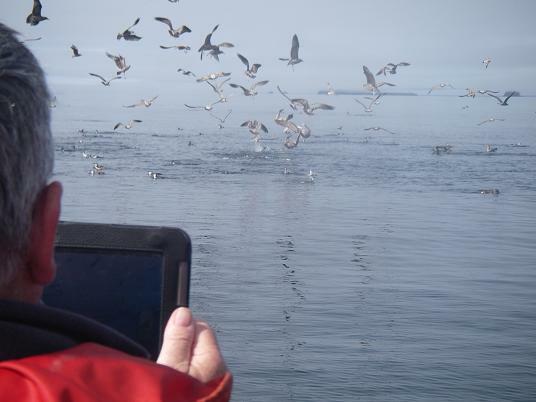 For a guide the gulls are one of the most important sites on a whale watching tour. Herring are one of the main foods for humpback whales. Ducks feeding on herring force them into a tight ball that may vary in size from basketball to boat size. As the ball rotates it tends to move toward the surface, which in turn attracts the gulls to feed. 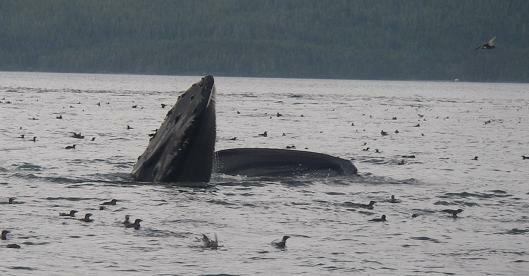 It also attracts humpbacks that lunge up and try to take the ball in one mouth full. Tomorrow…. 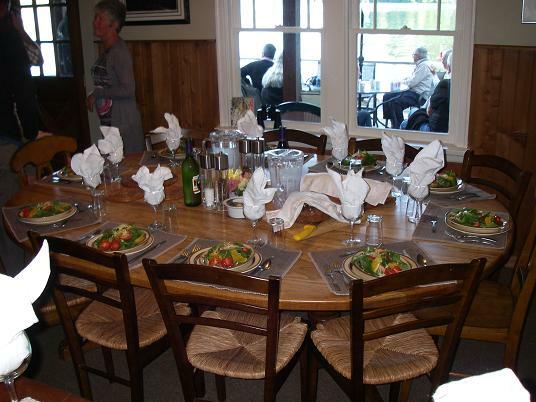 The table is set with salads, fresh homemade bread and wine. 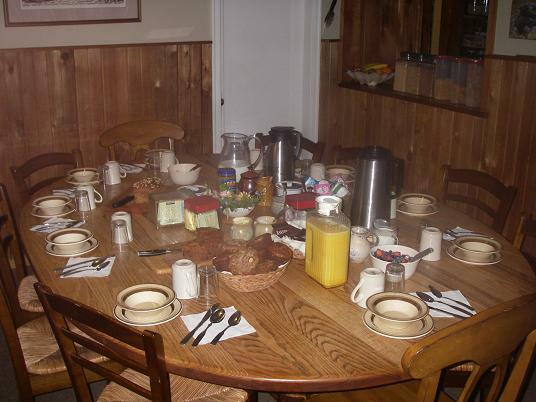 Dinning at Grizzly Bear Lodge is a “family affair” in that it is good food that the guests rave about and guests and staff share the same table leading to lively conversations. A guide rule is “what happens in the boat stays in the boat unless the guest open the topic”. The dining part of dinner may be completed in an hour but the conversation around the table last for several hours. At times (often after nine o’clock) we have to ask the guest to move into the living room so we can set the table for breakfast. After the photos comes breakfast. Breakfast consists of: likely the most important thing – coffee and boilded water for tea – then home made muffins and bread, cereals both cold and hot (in a package), fruit (fresh and in bowels to be added to cereal), yogurt, juices and then more coffee. The each boat has a great picnic lunch but guests often take a muffin or fruit for a morning snack. In the morning we always have a sunrise from the front deck it is just that most mornings the low-lying marine clouds make it hard to see. This cloud cover is gone before noon providing good light for photos. This photo was a quick snap from my camera as coffee was just being served and guests were on the deck needing room from their own “photo ops”.